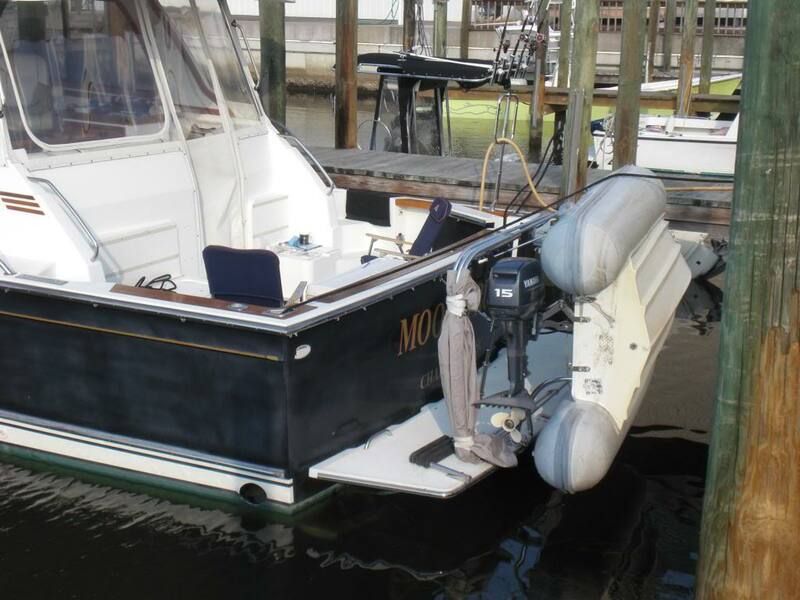 We have a 2004 34T Mainship trawler.We purchased a 9'10' hard bottom inflatable. We are thinking Weaver davits or Kingston 350 lift davit system. Any thoughts? I put a set of St Croix davits on Gray Hawk. Here's a picture of my new-to-me aluminum dinghy hanging on them. My thinking was that I wanted the dinghy to be ready to launch - in an emergency I can cut the lines and its ready to go. I suppose that's silly but that was my thinking. Those are nice looking davits, and I have seen them on other boats, whose owners think highly of them. That said there are more than a few brands around. The Kingston davit? If I have found the correct website I’d wonder though. I don’t think that davits that include handrail support are a good deal. Flex your stanchions and you will develop leaks, and see rotten decks a few years down the road. Keep in mind that I use my mast and boom, along with Harken sailboat hardware to launch my Avon 310 RIB so I might not be a good judge of davits. The Weaver davits are quick and handy...still like conventional davit systems because you can leave the motor on. The problem with conventional davits...you have to have two people or a SLOW system for one to lower the dingy...unless you severely modify them. Recently ordered a set of Forespar Nova Davits. Should arrive middle of January. Will post pictures once they are installed. Looked at the St.Croix davits but out swim platform is too narrow. I'm away from the boat right now but the first project when I get back in late Jan. is to mount 450 watts of solar panels on top of the davits. I don't think it's silly at all. I think it's very smart. I have said many times that I believe if a dinghy is the sole means of getting off the boat in an emergency then it should be carried in a manner that can get it into the water in just a few minutes without the need for electricity and no risk of injury to the person or people launching it, even in rough water. To me that means one of three ways-- in stern davits as you have done, on a swimstep mount like Weaver davits, or towed behind the boat. BTW, you might want to keep an eye on the bare aluminum bottom of your new dinghy (if it is bare). 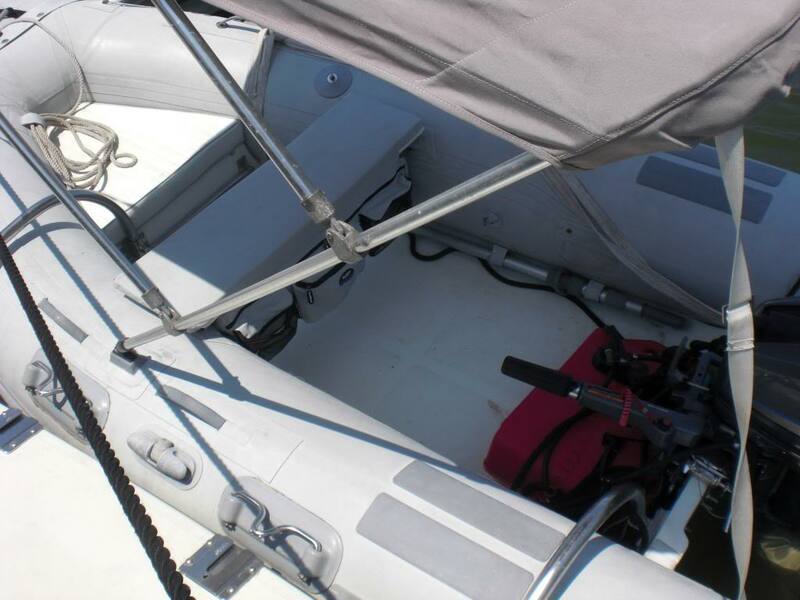 Carey of this forum bought a new Duraboat aluminum dinghy and carried it in stern davits. Soot from his exhaust built up on the bottom of the dinghy and combined with moisture to create an acidic condition that within two years or so started eating pinholes in the bottom of the Duraboat's bare aluminum bottom and Swiss-cheesed the keel strip. He had the bottom replaced and then sold it, replacing it with a 10' Bullfrog. The Bullfrog also has an aluminum bottom but it's powder coated an is easily replaced. No soot, no problem. But it's something to be aware of. BTW, you might want to keep an eye on the bare aluminum bottom of your new dinghy (if it is bare). I noted your caution about that in another thread. I thought I would turn it upside down on the dock and slap something on it for paint just in case. Something to note about traditional "hanging" davits: make sure you have a good drain in your dinghy or a sealed cover. We forgot to open the drain plug in the dinghy once on a previous boat and a few days of rain while away saw us return to the boat to find the dinghy full of rainwater and one of the davits collapsed. Expensive lesson. We use Weavers now for the Livingston on Levada. Quick and easy up/down with a four-point block/tackle. I have KATO davits on my Monk very nicely made, no mechanical problems so far. My one complaint its when lowering the dinghy it gets "caught" on the swim platform and must be pushed off which is not a real big problem but complicates the process the same occurs at lifting. Check it out here Ocean Marine Transom Mount Davit - Slick, sleek, strong, and smooth. The Weaver davits are quick and handy...still like conventional davit systems because you can leave the motor on. I like conventional davits, too. But we have a swivel mount for the outboard on our Livingston that's on our Weaver davits, so no need to remove it which I agree can be a time consuming job from what I've observed other people doing on their boats.
" The problem with conventional davits...you have to have two people or a SLOW system for one to lower the dingy...unless you severely modify them." Not really,our davit is set up using a single winch, which requires no manual locking mechanism, the dingy just stays at whatever height it is at when you stop winding the winch. it takes me about 15 seconds to launch the RIB into the water.about 20 to retrieve. I agree with Steve though, you need to push the RIB away from you a bit to clear the duck board when retrieving.Not an issue. Simpson Laurence , mounted in their removable show setup. Strong , handles loads of weight and they can be struck at haul out time . I didn't mean to infer all davit systems were a 2 man job...yours is set up nice and one way I would do it...but it requires a cross bar that has its advantages/disadvantages too. Moonstruck has Weaver Snap Davits to carry her RIB dinghy. The first picture shows the 15 hp 2 stroke on the Weaver Lever in the stored position. The second picture shows the bow locker arc and the transom arc. I think it puts too much stress on the tubes, so only use the pad brackets for boarding stability.. Makes it easy. YMMV. If you use Weaver, they are very helpful in customizing to your specs. Re: these davits systems. I was just going to tow my tender behind the boat. Is there any reason why davits are better than towing a tender? There may be a slight fuel burn addition but i would suspect it wouldnt be that noticeable? All I can see is it wipes out the marlin board for use due to the davits and tender being there and as I do a fair bit of diving will be using my marlin board a fair bit but yeah if some one could explain the idea behind them as I'm not really up to speed on davits. I had weavers on my last sailboat. My present dinghy was on SeaWise davits before I bought it. From those I note that the tip up style has very finite weight limits, which, if you exceed those limits, will damage your dinghy or your boat, or both. The Kingston also look like they will have finite weight limits. SO the first thing you need to do is weigh your dinghy and all of the gear that will remain init when on the davits. Then allow a margin for weight creep, which will happen more quickly in a dinghy that is hoisted up than in one that is tipped up. Bob, Congratulations! Apologies for the TC, but someone is taking up solar, and that`s good. The batteries will like the full charge and return the compliment. Your panels should be free of obstruction up there, even minor obstruction affects output considerably. Have you looked into regulator(s) for the substantial output you can expect, made a choice yet? Mine do bulk/absorb/float,and once a month equalize. I like your thinking and I like your dinghy a lot. Before we moved down to Washington where the moorage is very expensive that is exactly what I was going to do.